Indigenous Studies associate professor Rick Monture is one of two McMaster researchers to receive new federal funding for interdisciplinary research that could advance reconciliation. Two McMaster-led research projects that focus on Indigenous language revitalization are among the first recipients of federal Indigenous Research Capacity and Reconciliation – Connection Grants. Linguistics associate professor Ivona Kucerova is the lead researcher on a study that aims to identify the rigor of Indigenous pedagogy in language revitalization and possible pathways for collaboration with university-based research. Kucerova is the director of the Syntax Lab at McMaster and a full member of the Centre for Advanced Research in Experimental and Applied Linguistics. 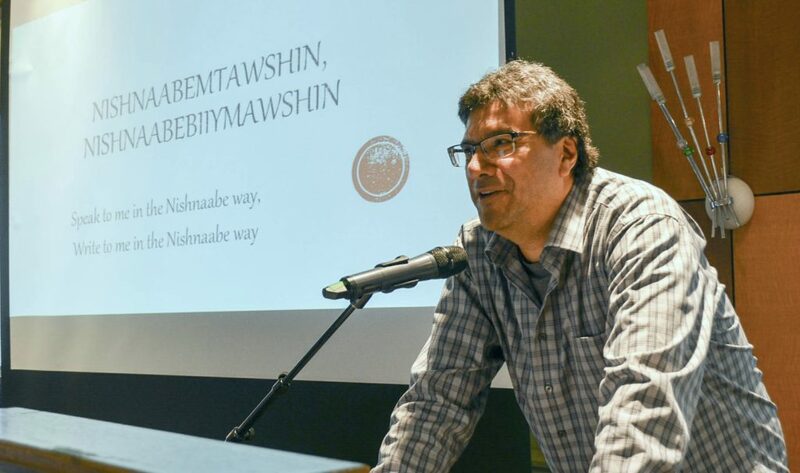 Indigenous Studies and English associate professor Rick Monture’s project is called Dwadewayehsta Gayogohno –“We are all learning Cayuga”: Maintaining and Preserving the Cayuga Language at Six Nations of the Grand River. Monture is a former director of the McMaster Indigenous Research Institute, and some of his earlier work on First Nations literature, history, and intellectual tradition also centred on the significance of Indigenous language and culture. His PhD Dissertation, entitled “Teionkwakhashion tsi Niionkwarihoten (we share our matters): A Literary History of Six Nations of the Grand River,” examined the intersections between oral traditions, Indigenous sovereignty and Haudenosaunee resistance to colonialism in Canada. In total, Science and Sport Minister Kirsty Duncan awarded 116 researchers at postsecondary institutions and not-for-profit organizations up to $50,000 apiece to identify new ways of conducting interdisciplinary research with Indigenous communities. The grants, administered through SSHRC, NSERC and CIHR, are designed to support a national dialogue to co-develop an interdisciplinary, Indigenous training model that contributes to reconciliation between Indigenous and non-Indigenous peoples. Two McMaster-led research projects that focus on Indigenous language revitalization are among the first recipients of federal Indigenous Research Capacity and Reconciliation – Connection Grants. Linguistics associate professor Ivona Kucerova is the lead researcher on a study that aims to identify the rigor of Indigenous pedagogy in language revitalization and possible pathways for collaboration with university-based research. Kucerova is the director of the <a href="https://www.humanities.mcmaster.ca/~kucerov/syntax_lab.html">Syntax Lab</a> at McMaster and a full member of the <a href="https://arieal.mcmaster.ca/">Centre for Advanced Research in Experimental and Applied Linguistics</a>. Indigenous Studies and English associate professor Rick Monture’s project is called Dwadewayehsta Gayogohno –“We are all learning Cayuga”: Maintaining and Preserving the Cayuga Language at Six Nations of the Grand River. Monture is a former director of the McMaster Indigenous Research Institute, and some of his earlier work on First Nations literature, history, and intellectual tradition also centred on the significance of Indigenous language and culture. His PhD Dissertation, entitled “Teionkwakhashion tsi Niionkwarihoten (we share our matters): A Literary History of Six Nations of the Grand River,” examined the intersections between oral traditions, Indigenous sovereignty and Haudenosaunee resistance to colonialism in Canada. https://twitter.com/FilomenaTassiMP/status/1084925034932682753 In total, Science and Sport Minister Kirsty Duncan awarded 116 researchers at postsecondary institutions and not-for-profit organizations up to $50,000 apiece to identify new ways of conducting interdisciplinary research with Indigenous communities. The grants, administered through SSHRC, NSERC and CIHR, are designed to support a national dialogue to co-develop an interdisciplinary, Indigenous training model that contributes to reconciliation between Indigenous and non-Indigenous peoples.